World War III – Which side are you on? 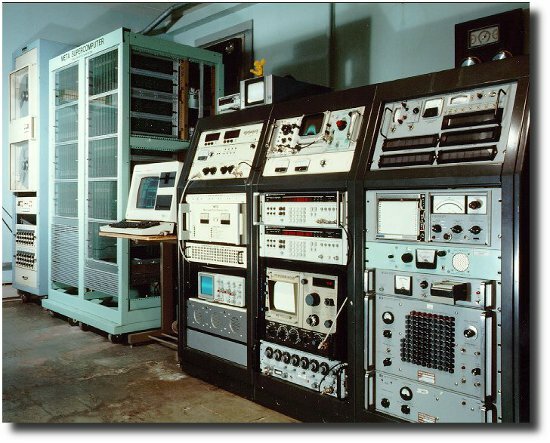 Further to my post “Hidden in plain view” connecting the development of Radar from Silicon Valley together with its later use in looking in to red Russia’s radar systems, it would seem the development of the Alma radio telescope in Chile would have a similar application. In view of this use, I happened to come across this posting, for me, originating from www.soldersmoke.com which I include here. Really, the relevance is their finding over a number of years of continual research into signals from space. “Of course, there’s a background level of radio noise from Earth-radio and television stations, aircraft, portable telephones, nearby and more distant spacecraft. Also, as with all radio receivers, the longer you wait, the more likely it is that there’ll be some random fluctuation in the electronics so strong that it generates a spurious signal. So we ignore anything that isn’t much louder than the background. Any strong narrow-band signal that remains in a single channel we take very seriously. As it logs in the data, META automatically tells the human operators to pay attention to certain signals. Over five years we made some 60 trillion observations at various frequencies, while examining the entire accessible sky. A few dozen signals survive the culling. These are subjected to further scrutiny, and almost all of them are rejected-for example, because an error has been found by fault-detection microprocessors that examine the signal-detection microprocessors. What’s left-the strongest candidate signals after three surveys of the sky-are 11 “events.” They satisfy all but one of our criteria for a genuine alien signal. But the one failed criterion is supremely important: Verifiability. We’ve never been able to find any of them again. We look back at that part of the sky three minutes later and there’s nothing there. We look again the following day: nothing. Examine it a year later, or seven years later, and still there’s nothing. would turn itself off a couple of minutes after we begin listening, and never repeat. (How would they know we’re paying attention?) But, just possibly, this is the effect of twinkling. Stars twinkle because parcels of turbulent air are moving across the line of sight between the star and us. Sometimes these air parcels act as a lens and cause the light rays from a given star to converge a little, making it momentarily brighter. Similarly, astronomical radio sources may also twinkle-owing to clouds of electrically charged (or “ionized”) gas in the great near-vacuum between the stars. We observe this routinely with pulsars. So now we have the Alma [Atacama Large Millimeter Array] Large Millimeter/sub-millimeter array, which translates into reasonable plain language to frequencies up to 100Ghz. Why would this be a military requirement? The answer to me is Stealth aircraft. They may well be ‘stealthy’ to existing radars but I suspect they’ll not be so stealthy to these ultra high frequencies. It may also be that the only way to get enough signal for detecting the remote radar stations operating on such high frequencies is to have an exceptionally large dish. This is it. ALMA was initially a 50-50 collaboration between the US National Radio Astronomy Observatory and European Southern Observatory (ESO). The array has been extended with the help of the new Japanese, Taiwanese, and Chilean partners. ALMA is the largest and most expensive ground-based astronomical project currently under construction (current cost estimate is US$1.3 billion). Tagged Real Wars. Bookmark the permalink.